BRUGGOLEN® TP-C1608 by Brüggemann acts as a heat stabilizer. BRUGGOLEN® TP-C1608 raises the long-term service temperature of PA parts to 150°C as compared to the 120°C that was previously regarded as the limit. 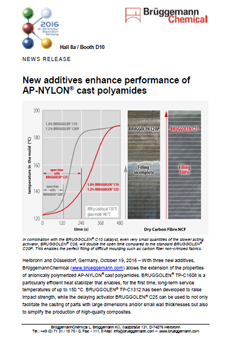 Used for developments for AP-NYLON® cast polyamides.